Jeremy Denk's new album c.1300-c.2000 traces seven centuries of classical music. 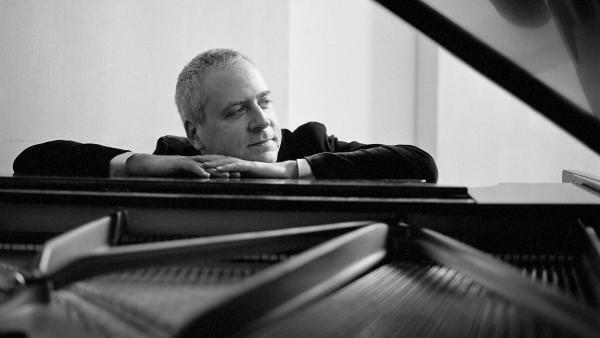 Pianist Jeremy Denk's latest album is a musical odyssey. Starting with the austere tones of medieval composer Guillaume de Machaut, Denk travels in time across the keyboard all the way to the 20th Century landing on the atonality of Karlheinz Stockhausen and the minimalism of Philip Glass. Denk's album, titled c.1300-c.2000, is a two-disc collection spanning seven centuries of classical music. Denk spoke with NPR's Melissa Block about the stories behind and within the album and how the language of music evolved over the centuries. Hear the radio version of their conversation at the audio link and read additional excerpts below. Block: This collection is such a huge range of styles compiled all in one place. What's the story you're telling here? Denk: Well it's a bunch of stories. It's like an epic poem of human accomplishment — different ways of seeing the world through music. I guess I was after, in one evening or one sitting, being able to tell that whole story in one way or another. As the centuries unfold, there are periods of impasse where [you think], how do you go on after Beethoven? How do you go on after Bach? What do you do next? How do you start fresh but still build on the past? And there are moments of incredible group achievement, where everybody's building on each other's ideas and they just can't stop extending the world of music and what it can do. So there's all kinds of narrative bits in this story, exciting car chases and lulls and doldrums. Let's explore some of the narrative bits, going back to the beginning. The first six or so pieces are vocal works arranged for piano, and in them you're exploring counterpoint. As you say in the liner notes, "If you don't care about counterpoint, you should." Explain for the layperson, why we should care about counterpoint. It's the fact that it's called counterpoint, which probably is its biggest problem from a marketing perspective, and that you study it in music theory. But basically, it's just more than one voice singing at the same time. You know the minute that you start singing "Row Row Row Your Boat" with someone else you're in counterpoint. We talk about the beginnings of classical music in Gregorian chant, one person singing alone, one line — so the notes go up and down over time. But when you put another person on top of that or below that singing at the same time, all these incredible permutations come into being and music has this second or third dimension that suddenly occurs. The end of the first disc is a piece by J.S. Bach, the Chromatic Fantasia and Fugue in D minor, from the 1720s. You write that when you play it, you feel like you're "standing on top of a great edifice of understanding." What are you seeing from up on top of that great edifice? Well, you're seeing partly like Bach. It's ridiculous ... The powers of the mind and the powers of the soul to interact in this way to create such an incredible emotional and spiritual, and every kind of, meaning out of the way that voices interact. And understanding a language of how notes go together, in a way that no one had really done before, like that. [The Fantasia], of course, is not counterpoint. This is more, "I'm trying out the keyboard and improvising." He's exploring every note of the chromatic scale, as if to say, "I can master all twelve notes on the keyboard. I can make them all work. I can slide between them, I can harmonize anything." So when we get to Beethoven in the 1820s — and on this collection it's his Piano Sonata No. 32 in C Minor — what has happened? I set up a little narrative one-two punch there because after Bach it's all sort of this complicated counterpoint and fugue, and then I wanted to have a sense of like you ripped the page off the the notebook and you start again. And so, Mozart comes, which is the ultimate kind of naive simplicity. Just a melody and a harmony — it's all just about one singing person and someone accompanying them. And so Mozart represents this new kind of classical purity, a new world of music that happens in the late 18th century. Beethoven comes right after to show the end of what Mozart, Haydn and Beethoven did. The new language that started with Mozart and Hayden in 1770, 1780, the three of them — Mozart, Haydn and Beethoven — played with its possibilities. In a way it's a kind of charming, elegant language. And then gradually, as we get to Beethoven, you begin to tear apart the things that are elegant in it and you begin to look at the underbelly again. So Beethoven represents that sort of transition from classical to the romantic, and the tearing apart of the boundaries of the style. You mention in the liner notes, "The urge to destroy follows upon the urge to create." Destruction, really? I think that's a fair way of putting it. Because very often, a language, a way of writing music, will come and it'll be great for a number of decades, right? And then it won't be enough, and it will have to change. Somehow the style dies like we do and then somebody else reinvents it and then takes it in a different direction. So it's an inevitable part of the history of music. We're jumping way ahead here to Philip Glass and he is the only living composer who's represented on your album. Talk a bit about this this Philip Glass piece. This is the Étude No. 2. There's sort of two threads in the last half of the 20th century. There's one [of] incredible complexity and dissonance — I don't want to say unlistenable — like the Stockhausen. And then there's another thread that rejects all that complexity and listens again for some sort of primal pleasures and simplicities of pattern in music, and in a way, reaches back before Mozart, Haydn and Beethoven. And so, that's I think what I was after, to hear these two diametric paths. And it's hard to know where we are now. I guess that's part of the album's message — after all this historical unfolding, where the hell are we? A musical odyssey now. We're going to travel in time across the keyboard, and we're starting in the 1300s with the austere tones of the medieval French composer Guillaume de Machaut. BLOCK: We'll move from the 1300s all the way up to the 20th century, landing on the jarring atonality of the German composer Karlheinz Stockhausen. BLOCK: Our guide on this keyboard journey is pianist Jeremy Denk. He's released a two-disc collection that spans seven centuries of classical music. And Jeremy Denk joins me now from New York. Welcome to the program. JEREMY DENK: Wow, thanks. It's a delight to be here. BLOCK: This collection is such a huge range of styles compiled all in one place. What's the story that you're telling here? DENK: (Laughter) Well, it's a bunch of stories, you know. It's kind of an epic poem of human accomplishment and different ways of seeing the world through music. So as the centuries unfold, there's periods of impasse, you know, where how do you go on after Beethoven or how do you go on after Bach? What do you do next? How do you start fresh but still build on the past? And there's all kinds of narrative bits in this story, you know, exciting car chases and lulls and doldrums. BLOCK: Well, let's explore some of those narrative bits, going back to the beginning. The first six or so pieces are choral works arranged for piano, and in them, you're exploring counterpoint, the interplay of voices. And as you say in the liner notes, if you don't care about counterpoint, you should. So why don't you explain for the layperson why we should care about counterpoint? DENK: It's the fact that it's called counterpoint which probably is its biggest problem from a marketing perspective (laughter) and that you study it in music theory. But, basically, it's just more than one voice singing at the same time. BLOCK: Let's listen to some of this piece. This is Josquin des Prez, an early Renaissance composer. DENK: Now the third voice enters on top. DENK: Now the bass comes in, always with the same idea of passing it around as this incredible sense of conversation. DENK: And you can hear they're becoming more active as time goes on. BLOCK: The conversation is expanding. DENK: That's right, yeah. And this one returns us to simple - just a few notes. DENK: And the second voice again taking on from the first voice. DENK: Just exploring those simple notes - (vocalizing). Now the third voice - (vocalizing). DENK: And it - the third voice gives a different perspective to the other two, which are still going on, right? It sort of rehears them, and they become almost like a prism, all these different colors, different shadings, that happen as the voices interact. BLOCK: The end of the first disc is a piece by Bach, "Chromatic Fantasia And Fugue In D Minor," from the 1720s. BLOCK: You call this a perfect historical hinge. You write that when you play it, you feel like you're standing on top of a great edifice of understanding. What are you seeing from up on top of that great edifice? DENK: It's ridiculous the powers of the mind and the powers of the soul to interact in this way to create such an incredible emotional and spiritual and every kind of meaning out of the way that voices interact. DENK: This, of course, is not counterpoint. This is more trying out the keyboard and improvising. He's exploring every note of the chromatic scale as if to say I can master all 12 notes on the keyboard. I can make them all work. I can slide between them. I can harmonize anything. BLOCK: So when we get to Beethoven in the 1820s, and on this collection, it's his piano sonata No. 32 in C Minor, what has happened? DENK: I set up a little narrative one-two punch there because after Bach, it's all sort of this complicated counterpoint and fugue and so learned. And then I wanted to have, like, a sense of, like, you ripped the page off the notebook and you start again. DENK: And so Mozart comes, which is the ultimate kind of naive simplicity, you know, just a melody and a harmony. It's all just about one singing person and someone accompanying them, yeah? And so Mozart represents this new kind of classical purity new world of music that happens in the late 18th century. DENK: Beethoven comes right after to show kind of the end of what Mozart, Haydn and Beethoven did. DENK: The language that started with Mozart and Haydn in 1770, 1780, that new language, the three of them, Mozart, Haydn and Beethoven, they played with its possibilities. And in a way, it's a kind of charming, elegant language. And then gradually, as we get to Beethoven, you begin to tear apart the things that are elegant about - in it, and you begin to look at all the the underbelly again, you know? And so Beethoven represents that sort of transition from the classical to the romantic and the tearing apart of the boundaries of the style. BLOCK: You mention in the liner notes something that's fascinating to me - the urge to destroy follows upon the urge to create. Destruction, really? DENK: I think that's a fair way of putting it because a language, a way of writing music, will come, and it'll be great for a number of decades, right? And then it won't be enough. And it will have to change. And then somebody else reinvents it and then takes it in a different action. So it's an inevitable part of the history of music. BLOCK: We're jumping way ahead here to Philip Glass, and he is the only living composer who's represented on your album. DENK: That's slightly regrettable, I realize, but yeah. BLOCK: Well, talk a bit about this Philip Glass piece. This is "Etude No. 2." DENK: There's sort of two threads in the last half of the 20th century. You know, there's one to incredible complexity and dissonance and I don't want to say unlistenable but not friendly. BLOCK: (Laughter) Like the Stockhausen we heard earlier, maybe. DENK: Yeah, like Stockhausen we heard earlier. And then there's another thread that, in a way, rejects all that complexity and listens again for some sort of primal pleasures and simplicities of pattern. DENK: And so that's I think what I was after after the Stockhausen, to hear these two diametric paths. And it's hard to know, you know, where we are now. I guess that's part of the album's message is, you know, after all this historical unfolding, where the hell are we? BLOCK: I want to ask you about the very end of the collection. The next to last piece is from the Hungarian composer Ligeti. It's dramatic. It's urgent. And it ends on this huge crashing chord. BLOCK: But that's not the end of the collection. You circle back in time all the way back to the 1400s. BLOCK: What are we hearing here? DENK: We're hearing Binchois - yeah, a song from the 1400s. You know, I get weirdly choked up when I play that in concert and when I hear it again after all the destructive and kind of astounding music that happens in the preceding couple centuries. BLOCK: You get choked up, really? DENK: Well, yeah, I hear those sounds again, the purity of them and the interaction of them. And you think about the whole edifice of this history built on those sounds and those intervals and chords, you know? It's very much like a long life that you see in retrospect. BLOCK: "Sad Pleasure" - well, Jeremy Denk, thank you so much for taking us with you on this musical journey through time. DENK: It's a pleasure. Thank you for having me. BLOCK: Jeremy Denk's latest release is titled "c.1300-c.2000." (SOUNDBITE OF GILLES BINCHOIS' "TRISTE PLAISIR - II") Transcript provided by NPR, Copyright NPR.